The difference between WTF Group and typical property managers are their hands on approach managing their portfolio. More than a property management firm – they are building owners who take pride in their properties. This is precisely why working with the WTF Group resulted in one of Premier Elevators more celebrated designs. 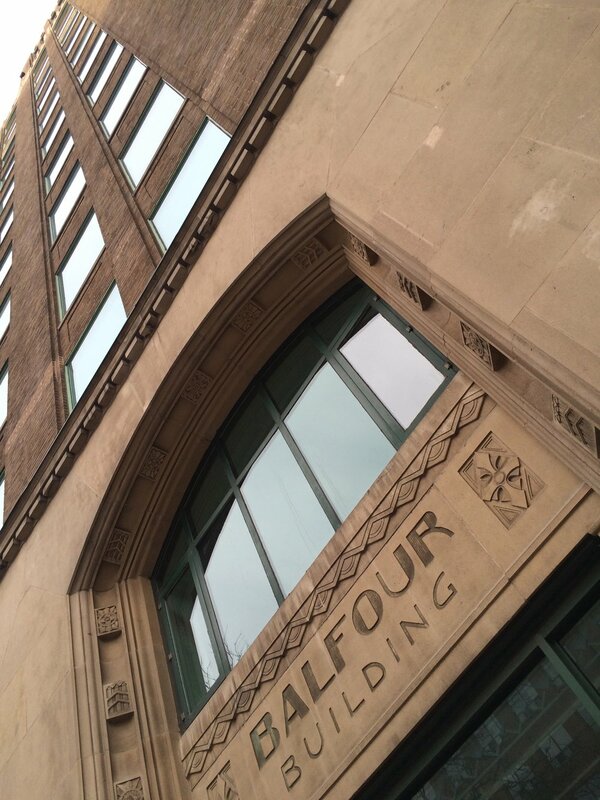 A landmark 1930s tower, The Balfour Building stands as one of Toronto’s finest examples of Art Deco style. With its beautiful interiors, stunning architecture and premier location, this 12 story property remains one of the most sought after buildings of its kind. The Premier team wanted to celebrate the heritage and architecture in a very unique way. After attempting to secure the original blueprints from Toronto’s achieves the designers accepted the challenge to create their own. Working in both hand sketches and computer aided design, the creatives were able to produce an architectural elevation that resembled traditional blueprints. These custom graphic panels were printed on a durable vinyl substrate with low iron ‘crystal’ clear glass and framed with an overlapping stainless steel binder. Travertine wall panels are trimmed with ‘L’ angles and divided by raised steel inlays. Double tubular handrails are anchored through a matching brushed stainless steel support band and returned inwards offering additional hand support to the users while increasing space at the entryway. Lastly the ceiling panels are pan formed and extruded from the roof aligning with the wall panels creating a visible coherence. A n engineered “travertino” porcelain was substituted for natural tile for durability reasons while flawlessly accenting the colours in the natural stone and steel.